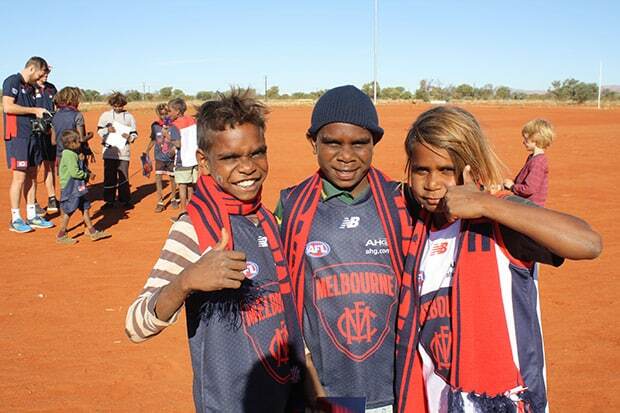 The red dust of the Northern Territory is a long way from the lush grass of the MCG but distance and different playing fields don’t stop the children of the NT loving their Aussie Rules footy. And this love of football is even helping to prevent blindness among Indigenous and Torres Strait Islander communities. Players from Melbourne Football Club’s AFL and AFLW teams regularly visit the NT to promote Aussies Rules, a healthy lifestyle and spread an important message about the potentially blinding eye disease, trachoma. Trachoma is an easily preventable infectious eye disease which can lead to vision impairment and blindness, if not diagnosed early and treated with antibiotics. The bacteria Chlamydia trachomatis causes inflammation and swelling under the inner eyelid leading to scarring. The scars cause eyelashes to turn inward and scratch the eye, producing intense pain made worse by blinking. 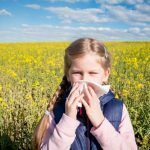 Eventually, the scratched cornea becomes cloudy leading to irreversible blindness. Trachoma persists in areas with poor personal and community hygiene and Vision 2020 says that 50 developing countries throughout Africa and Asia are affected by this eye disease, particularly in rural areas. Sadly, Australia is the only developed country in the world to still have active trachoma in some remote Indigenous communities. But Australia has committed to eliminate trachoma by the year 2020 with the help of awareness programs like the ones being promoted by the Melbourne footballers. 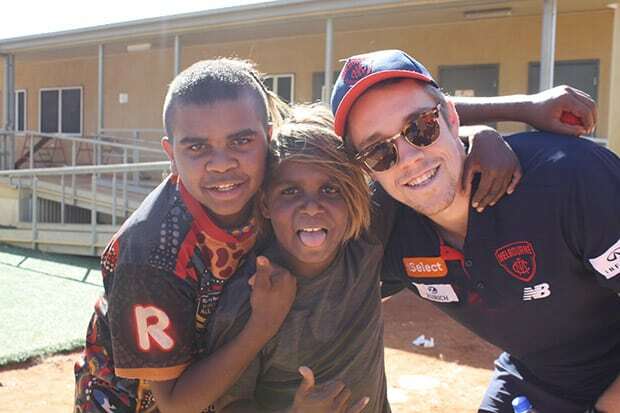 Melbourne football club player Pat McKenna with fans during a visit to Papunya School in May. Photo, Caitlin Nobes. 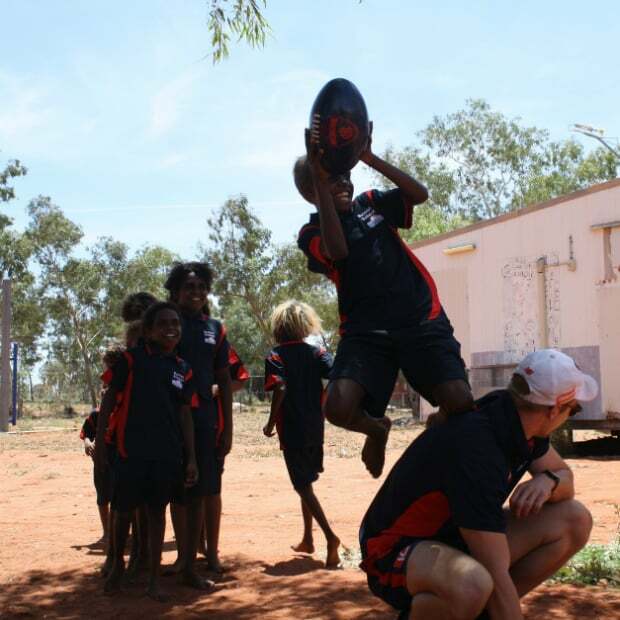 While talking about footy and running footy clinics with school-children in the NT, the footballers have been relaying the vital message that washing hands and faces daily, and blowing your nose, can help prevent spread of trachoma. Trachoma is most often found in small children but scarring and in turned eye lashes are found in older people throughout the country. The football club has partnered with ophthalmologist Professor Hugh Taylor, who has been fighting the eye disease for years, and his team at Indigenous Eye Health, University of Melbourne including optometrist Mitchell Anjou. They work with health departments to come up with strategies for trachoma elimination including education resources. Optometrist Mitchell Anjou and Milpa the trachoma goanna. One of these strategies is the character, Milpa, the trachoma goanna who washes his face every day and goes to the optometrist. Milpa features in educational materials and is involved in community activities with music, art and sport to encourage and reinforce the importance of clean faces for children, appears in videos and hands out soap and hygiene kits. In the above video, Melbourne Football Club trachoma ambassadors Jay Kennedy-Harris, left and Neville Jetta, right, with Milpa the trachoma goanna and the club mascot advise children to wash their faces and blow their noses to help prevent trachoma. The hard work is paying off. 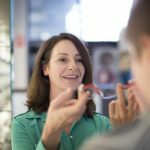 When reporting on progress in a Roadmap to Close the Gap on Vision, Mr Anjou said, in 2017, that activities by optometrists and trachoma elimination strategies meant trachoma in Indigenous children aged nine and younger had dropped from about 21 per cent to under five per cent, trachoma ‘hot spots’ had reduced from 54 to 16, and the number of communities without trachoma had jumped from 27 to 75. AFLW players Aliesha Newman (L) and Mia-Rae Clifford from Melbourne Football Club with Milpa the trachoma goanna promoting 'Clean Faces, Strong Eyes' in 2017. 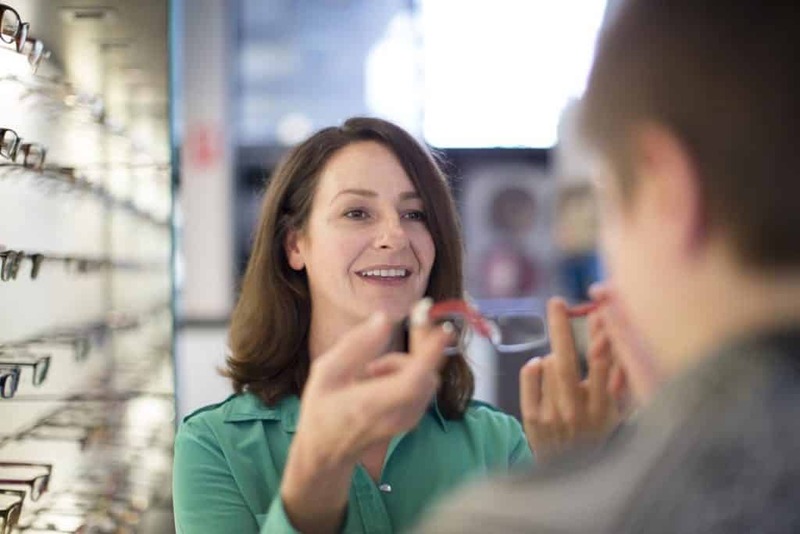 Photo: Indigenous Eye Health, University of Melbourne. The club has appointed as its trachoma ambassadors, champion Indigenous footballers Neville Jetta, Jeff Garlett and Jay Kennedy-Harris. They work to raise awareness of trachoma and take on additional work to promote the ‘clean faces, strong eyes’ message including public service announcements played on radio in the NT. Jetta and Kennedy-Harris are also the club’s Indigenous Ambassadors and work to promote and actively support Melbourne’s work within Indigenous communities. 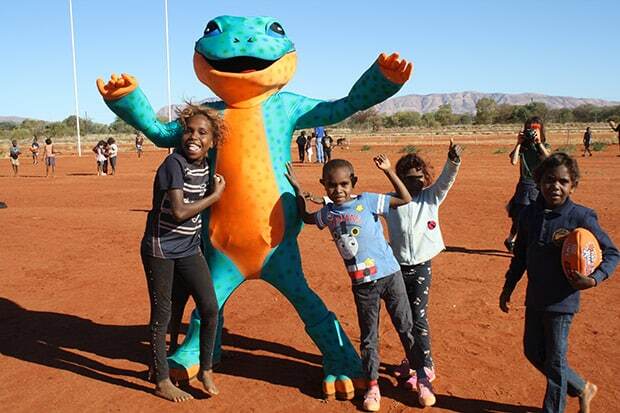 Earlier this year AFLW players Aliesha Newman and Ashleigh Guest along with AFL player Pat McKenna visited the Papunya School, located in the town of the same name which is 240 km from Alice Springs. They helped with a local footy clinic run by AFL NT and were on hand when the Indigenous Eye Health unit presented to the students on how to prevent trachoma. Up there Cazaly! Taking a speccie at Papunya during a footy clinic at Nyirripi. Photo, Caitlin Nobes. The group also visited Santa Teresa to help with a trachoma awareness day. The footballers helped deliver the message about cleaning your eyes and face regularly to help get rid of trachoma, before running a footy clinic for the young kids in the community and a kick to kick with the local football team. 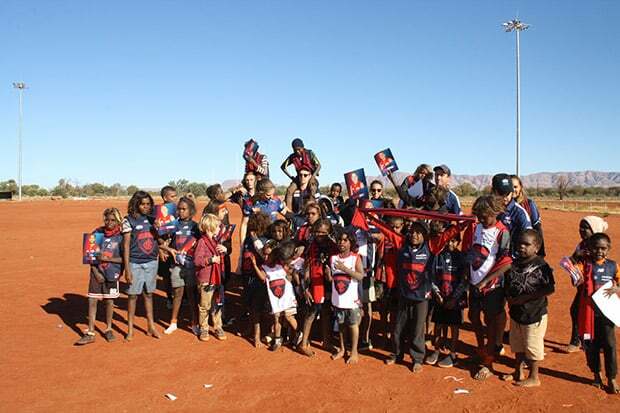 AFLW player Melissa Hickey told the Northern Territory News during another visit to Santa Teresa, Nyirripi, Hermannsburg and Titjikala: "On the car ride out we were talking and were saying three years ago we were playing very amateur football back in Victoria. 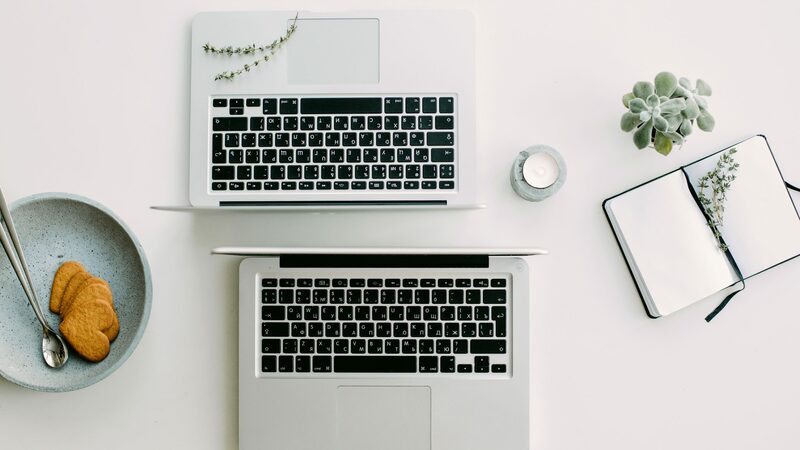 To think about how far we've come and obviously now having that role-model title is something that is really important and I take great responsibility in. These kids obviously really look up to us and we have a duty to pass on what we've learned and those positive messages as well. It's pretty amazing." Hickey said tackling trachoma was a particular focus. "We went up to Darwin last year and had a little bit of an education (about NT communities) but I think until you come out and experience it you are kind of removed from the realities. The Melbourne Football Club has the Read Like A Demon program so we stress the importance of reading and we've been spreading trachoma awareness. 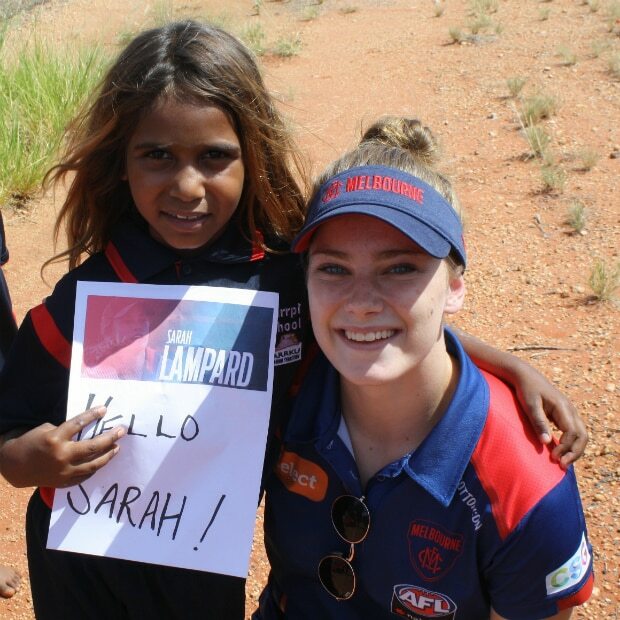 AFLW player Sarah Lampard with a fan during a visit to Nyirripi this year. Photo, Caitlin Nobes. Papunya School students in May with AFLW players Aliesha Newman and Ashleigh Guest and AFL player Pat McKenna. Photo, Caitlin Nobes.